Originally known simply as "The Swan", the addition of "Revived" was merely the result of a licence renewal rather than this famous building's miraculous escape from the fire which befell Newport Pagnell in June 1880. 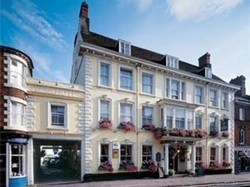 Indeed, it is very fortunate that this fine old coaching inn still exists. It is thought that a hostelry has stood on the site since medieval times. However, the current Swan dates largely from the 1600's with the present facade being a mid 19th century addition. An important stop on several routes during the age of horse drawn coaches, it is unsurprising that Newport Pagnell should have possessed a large number of establishments catering for travellers in its heyday. Alas, most have disappeared, but we do know that The Swan Revived welcomed some notable names, some of whom documented their visits. The famous diarist Samuel Pepys recorded his stay of June 8th 1688 as: "At night to Newport Pagnell; and there a good pleasant country-town, but few people in it. A very fair--and like a Cathedral--Church; and I saw the leads, and a vault that goes far under ground, and here lay with Betty Turner's sparrow: the town, and so most of this country, well watered. Lay here well, and rose next day by four o'clock: few people in the town: and so away. Reckoning for supper, 19s. 6d. ; poor, 6d. Mischance to the coach, but no time lost." Other iconic figures from history to have partaken of its hospitality include Benjamin Disraeli in 1874. Today, the Swan Revived is a 3-star rated hotel offering 40 guest rooms in all. Reviews and Booking. Please note that nightsinthepast.com plays no part in the actual review, booking or reservation process for The Swan Revived or any other accommodation. Costs for maintaining and developing Nights in the Past are met solely by it being the last referring site to our partners which results in a completed reservation.